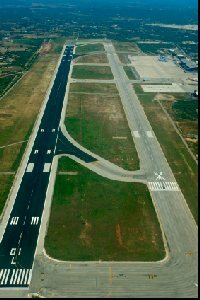 Airports in Spain are all managed and controlled by the Spanish government through the state controlled company Aena. All Spanish airports that is apart from the newly constructed Ciudad Real Don Quijote airport which has been financed by private backers. For each individual Spanish airport one can access detailed information on ground transport links, flights and destinations and Spanish natives suggestions for making life easy simply by clicking on its name. Both Madrid and Barcelona enjoy a great deal of flights from the USA, Canada, South America and in recent years the Middle East. Asian airlines have yet to make a big impact although both Thai Airways and Korean air have started daily flights to Spain from Bangkok and Seoul in recent years. The vast majority of Spains airports enjoy connecting flights throughout Europe and this is especially so in the summer season when charter airlines add flights to the Sun and Sea as Europe goes on holiday. So drastic are these seasonal fluctuations that for a brief number of days each summer Palma de Mallorca airport becomes the busiest in Europe. Once inside Spain one quickly finds that domestic flights are a great time saver compared to travelling via the outdated road network. Of course to reach the Balearic and Canary islands as well as the North African enclaves of Ceuta and Melilla its almost obligatory to fly. The campaign for greater access in airports for disabled passengers has proved particularly effective in Spain with Aena launching a dedicated website, telephone line and assistence service in every one of its airports with regular passenger flights. For details on travelling through airports in Spain as, or caring for a disabled person, see our comprehensive free online guide.